I found this game in a combination games box (see below), but I am not really sure if it belongs there. This has happened to me before (here is another example). In this case, the combination box was quite uncomplete and, on the other hand, contained some games and parts that obviously had been added later. 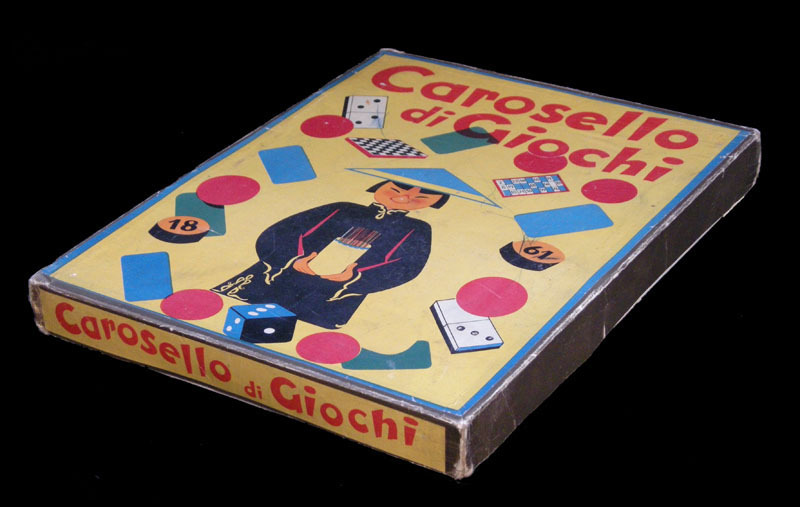 The rules mention "il nostro giro d'Italia confezionato in scatola", so it is possible that there is another version of the game. This board measures 66 x 49 cms. Technically, this is not a race game. The winner is not the first player to reach the last square of the board (or to reach a given number of points) but the player with most points collected when all the players have reached the end of the board. However, it is a game of pure luck (no strategy involved, no decisions taken), which is why I am including it in the games-of-goose section. Dating this game is an interesting cycling history exercise. Look at the six riders pictured. 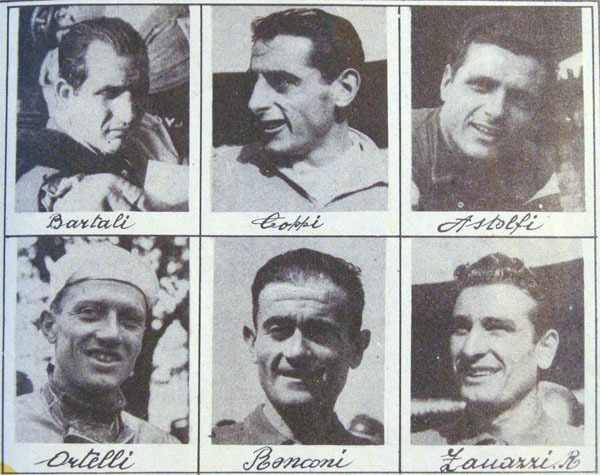 Of course Bartali and Coppi are obvious choices. But who are the other four? a) Vito Ortelli is probably the next best known cyclist in the list, but very far from Coppi and Bartali. By the way, he is also featured in this other game. (Coppi and Bartali also are, of course, but for Ortelli it is an impressive result to be featured in two games). Vito Ortelli was a professional cyclist between 1940 and 1952. His best results were between 1946 and 1948. He was third in the final overall standings of the 1946 Giro d'Italia, in which he wore the maglia rosa during 5 days. He won the Italian national championship in 1948.
b) Aldo Ronconi was also a professional cyclist between 1940 and 1952. His best results were in the 1946 and 1947 seasons. In 1946 he won the Italian national championship, one Giro d'Italia stage and was 5th in the final overall standings. c) Renzo Zanazzi had a shorter career than Ortelli or Ronconi. He was a professional cyclist between 1946 and 1952. Again, he had good results during 1946 and 1947: one stage in the Giro in 1946, two stages (and three days in maglia rosa) in 1947. He is considered one of the best early post-war Italian sprinters, but there were probably more important riders that could have been featured in this game. d) Italo Astolfi is even a weirder choice for a Giro d'Italia game. He was 7 times Italian national track champion between 1941 and 1950 but I am not really sure if he ever took part in the Giro. 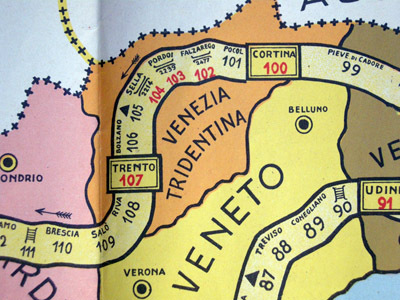 With these data in mind, it is obvious that the game was not made before 1946. However, maybe more important than the riders featured in the game are the riders not featured. 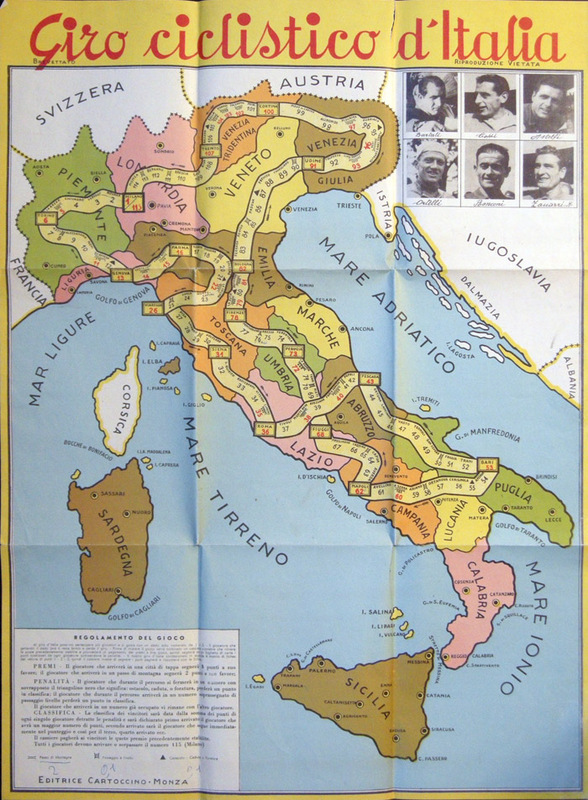 I do not mean Oreste Conte or Adolfo Leoni (who also had good results in the second part of the 1940s, probably better than Zanazzi's) but of Fiorenzo Magni, of course. 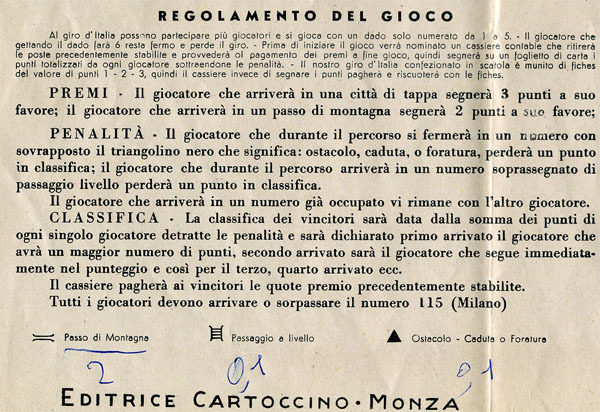 Magni was the third most important Italian rider in the post-war years, though he was somewhat younger that the riders featured in this game. He won his first the Giro d'Italia in 1948 (he also won in 1951 and 1955, among many other races), and he had a superstar status only second to Coppi and Bartali. 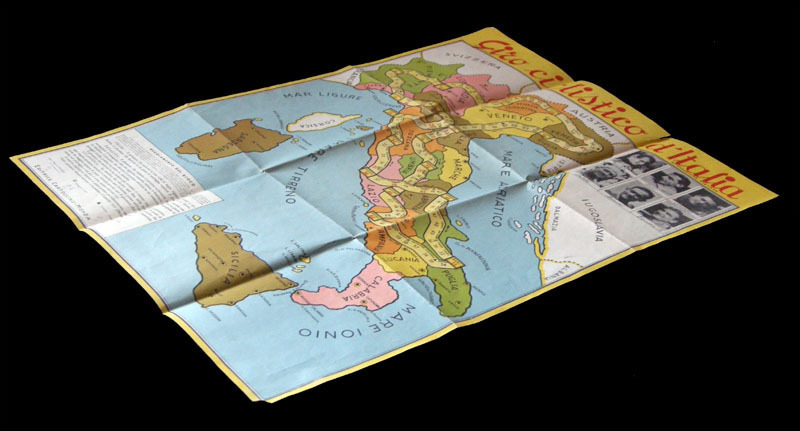 That is why this game can be safely dated as being older than the Giro of 1948. PS: If I had examined the board when I wrote the paragraphs above, it would have saved me some work. 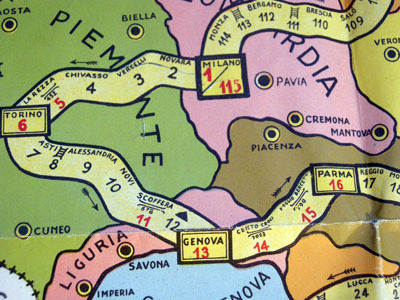 The game follows the stages of the Giro of 1948... It can be assumed that it IS from 1948. This is the combination games box where I found this game. It does not have much information, nor was a list of games included. It contained some items that were obviously added later (as a Stella game of goose, some 1970s cars, and an MB 1970s catalogue...) but of course some (probably most) items must be original. Some of the boards included in the box. 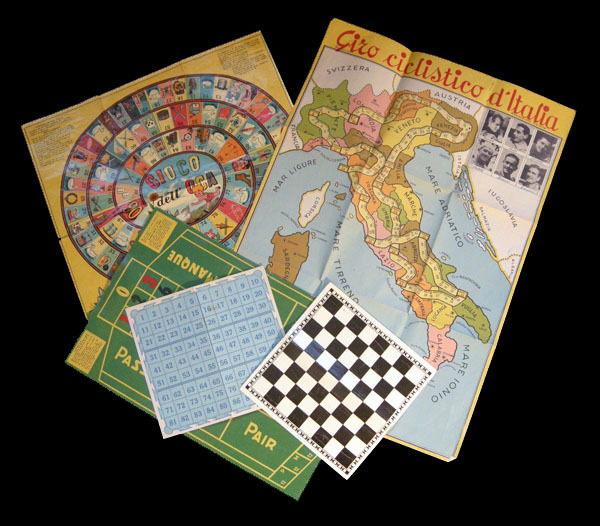 The game of goose you see is by Cartoccino too. (The one by Stella is not shown on this picture). The smaller boards are unbranded.